CAPE CANAVERAL, Fla – The launch date of the next Falcon 9 rocket with its Dragon Spacecraft payload has been announced to occur no-earlier-than Dec. 19. This will mean that it will have been over a year since the last time that the NewSpace firm launched one of its rockets. At a speech at the National Press Club on Thursday, SpaceX founder and CEO Elon Musk also confirmed that the flight of Dragon will likely be delayed — perhaps until January — due to the failure of a Soyuz rocket carrying a Progress re-supply ship to the ISS on August 24, 2011. The Russian Space Agency has scheduled Progress launches on October 30, 2011, and January 26, 2012, with potential launches for the manned Soyuz-FG spacecraft on November 12 and December 20, 2011. SpaceX last launched one of its Falcon 9 rockets on Dec. 8 of last year. 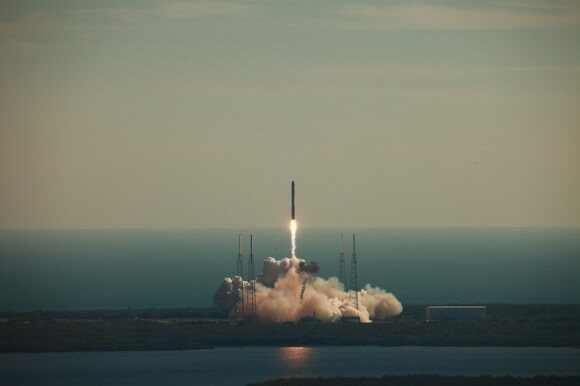 That launch saw the first flight of the company’s Dragon Spacecraft, which completed two orbits before splashing safely down in the Pacific Ocean off the coast of California. This event marked the first time that a private entity had accomplished this feat. Up until that time only nations had sent and retrieved spacecraft from orbit. Also during Musk’s speech on Sept. 29, he announced that SpaceX is developing the world’s first, fully-reusable rocket. Musk said that the development of this as-yet-unnamed rocket, if successful, would greatly reduce the cost of launching to orbit and open the doors to manned flights to Mars. But the SpaceX CEO cautioned that success was not guaranteed. With the space shuttle fleet retired and being prepared for display in museums and tourist attractions, NASA is relying on many proposed commercial space taxis that, unlike the Dragon which has flown, have yet to be tested. Boeing, Sierra Nevada Corporation and Orbital Sciences Corporation all have proposed designs to ferry astronauts to and from low-Earth-orbit and the International Space Station. Because they probably have NASA engineers or ex NASA contractors working for them that know what to do and know what not to do. In addition modern computer can do stuff that 5 years or more could not. They are recreating technology that they already know that will work. It is a big different thing if you design something that no one before ever did. This is exactly right. Both SpaceX and Bigelow Aerospace were given their key technologies for nothing more than lose pocket change by NASA. Everything that Bigelow has was developed by NASA (NASA was banned by congress from developing inflatable spacestations – I think we all suspect bribery was the cause:P). The new, innovative heatshield that makes the Dragon both Lunar and Mars rated was developed by NASA. Awesome stuff:). Along the same vein, the new spaceplane that Orbital Sciences is developing was created as a scaled down test version of the Soviet Burian, which NASA was informed about (by CIA pictures IIRC?). They then developed the same technology themselves, thinking that the soviets were creating a minishuttle (they weren’t, it was just a well designed test of the tech needed for a full scale shuttle). This Soviet inspired NASA technology is now being used by private space. So yeah, SpaceX and everyone else in commercial space owe everything they have to organizations like NASA and the Russian Space Agency. It’s not like they’re developing this stuff on their own. They’re just borrowing great ideas that the space agencies were never able to fully capitalize on for various reasons (sometimes political, sometimes because their technology was too primitive at the time, etc). Because they don’t have politicians jerking their funding around every other year to score political points in an election year. Ayn Rand has nothing to do with this. These people are engineers and scientists, exactly the kind of people? that Rand makes out to be villains. But yes, this is an amazing plan. Hope it works. I would hope she haven’t – you are the first mentioning philosophy here. Not too bad, the original launch was pushed to last november when it became possible to combine both COTS II and III missions. As usual NASA adds delays to mitigate real or imagined risks, but at least this time it is up front. This will mean that it will have been over a year since the last time that the NewSpace firm launched one of its rockets. This again? SpaceX isn’t a “NewSpace” firm, which is an umbrella term for the space enthusiast movement: “often affiliated with, but not synonymous with, the private spaceflight industry.” I would think space journalists generally would be careful with terms, especially around those that devalue their subject. This is of course but another recurrent theme in these articles, as if delays are some kind of error or problem. But rightly it should be compared with the official track record. – Mercury-Gemini 1963-1965: 2 years. – Gemini-Apollo 1966-1968: 2 years. – Apollo-STS: 1975-1981: 6 years. – STS-SLS: 2011-2019 (projected): 8 years. Besides the growing trend, we have a recurrent average gap of ~ 4 years between major technologies in non-private projects. It isn’t at all shoddy of SpaceX to have 1 year between a Dragon test and a Dragon use launch! Even 4 years to the first manned Dragon mission would be average. More than 8 years may be considered unduly sloven. Especially if the basis is (NASA) risk management, these delays then translates to success within a bureaucratic system. I think we should read it as that. There was also the question, for a time, of whether or not there would be anyone aboard ISS to receive it. Dragon can’t fully dock alone, someone must operate the arm to berth it. The arm can be operated from Earth (so docking is possible), but it would be kinda stupid to send a cargo vessel to the station and not have anyone there to unload it;). Do you actually think that Dash really makes you laundry whiter than white? Do you actually think that a Painkiller goes directly to the pain spot? Do you actually think that Axe deodorant attracts hot young woman?